← Leave Jose Canseco Alone!! He’s my Super Hero. Padres Blogs Unite! I’ve said it a million times, I love baseball…it is my passion. I also love a good party. Welp, Major League Baseball season is upon us, my friends, so we must celebrate with a party. Not gonna lie… I’m so excited for opening day this week, I feel like JoJo the idiot circus boy with his pretty new pet. Over the past month, I don’t know how or when it exactly happened, but all the sudden, we here at LobShots…how do I say this? We’re kind of a big deal. 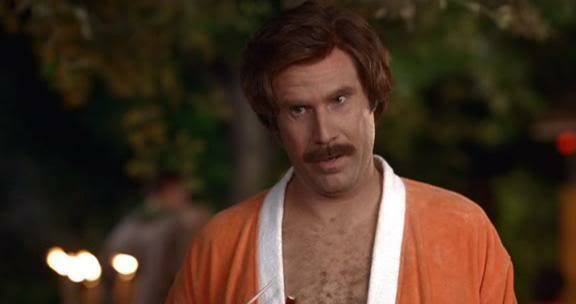 I have it sneaking suspicion it went down when Kate Upton proposed to me, but that’s all speculation. Focus. 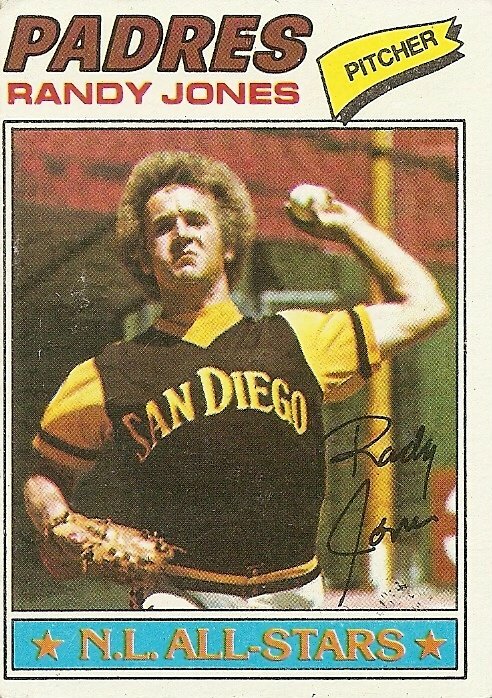 So, the who’s who in the San Diego Padres blogging community hit us up to partake in some hometown Padres festivities to party with none other than Randy Jones, Padres Cy Young award winning legend and personal hero of mine. No joke, the first blog I ever did here on LobShots was a recap of the Adrian Gonzalez Celebrity Bowling Event. At the event, two amazing things happened… I had a run-in with the Chargers’ Vincent Jackson, which led to this redemption post, but more importantly, Showman and I got to spend some time with Randy Jones. He was awesome and hysterical. Naturally, our friends over at RJs Fro came to mind, because they had the savvy to name a blog after this fine gentleman…and his fro. 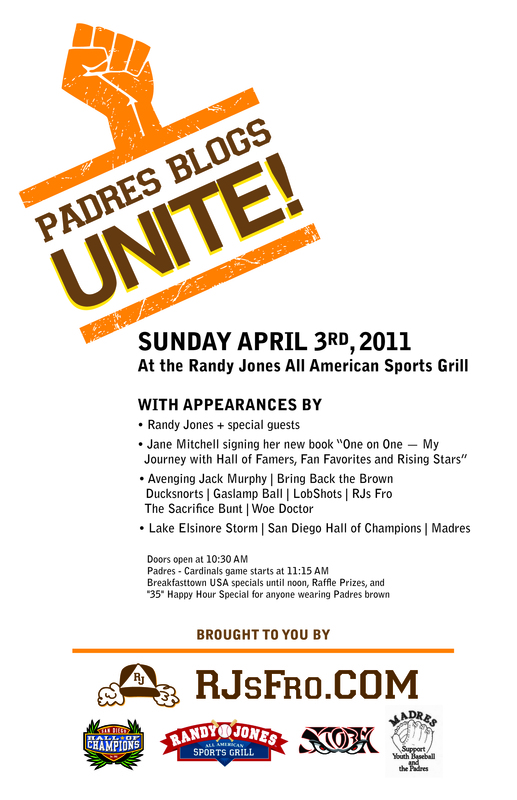 We got the chance to meet them and a couple other Padres bloggers at FanFest this year, and we are proud to set aside April 3rd, 2011…THIS SUNDAY…as a day of Padres and Partying. Where? You guessed it, Randy Jones All American Sports Grill in Hazard Center here in San Diego. We will be gathering to watch the Padres 3rd game of the season in St. Louis against the Cardinals as a joyous event to celebrate the home opener which will be on April 5th. We are genuinely fired up for this event. Showman and I have big plans…four of them. 1) hanging out with anybody who reads this blog 2) eating with anybody who reads this blog 3) drinking with anybody who reads this blog 4) watching some baseball with anybody who reads this blog. It’s a complex list, but we feel with proper preparation and well timed execution, we should be able to pull it off. We’ll be the two dudes wearing BROWN Padres gear. Oh wait, everybody will be wearing brown Padres gear. Check out the post on RJs Fro for the details for this event. Here’s the schnazzy flyer. Woah, woah, woah… back up the freakin’ truck, LobShots, did you just get all fancy pants on us? You’re damn skippy, we did. You read that right. San Diego Hall of Champions, Storm baseball, Jane Mitchell signing books, the Madres, crazy drink specials for rocking Padres brown, and other special guests that are probably really special. If you want to check them out, here are the links to the other Padres blogs that will be rocking this party. Ducksnorts, Gaslamp Ball, Avenging Jack Murphy, Woe Doctor, The Sacrifice Bunt, Bring Back The Brown. This party is gonna be sick. 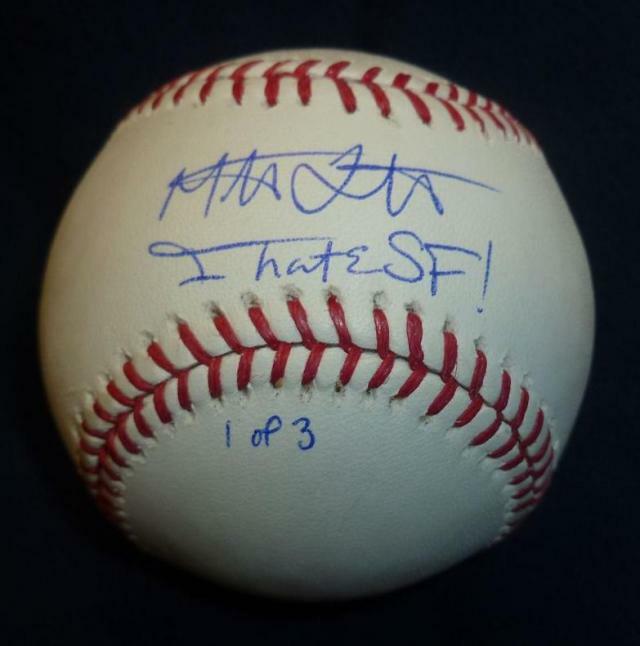 One of my favorite things too, is that one of those #balls that Mat Latos signed “I HATE SF” is gonna be auctioned off. That’s when we got tight with RJs Fro, they were in battle with some crap San Francisco blog that was all over them like a cheap suit. Of course, we came to their side with our now infamous, “Mat Latos made San Francisco Cry” blog. Sent those fools back to mamby pamby land where maybe they can find some self confidence…ya jackwagons. Please come out and join us for a drink and some good times. If you’re here in San Diego, there’s really no excuse for you to not be here. Total side note, I didn’t make this flyer, but I would like to point out that this Sunday’s event has nothing to do with Communist Russia or the Black Panthers. So, you can check that right off your list of reason to not come. Oh, and if you’re a March Madness freak like us (Go VCU!) and you’re worried about the Final Four, don’t be… semi’s are Saturday the 2nd, and the championship game is Monday the 4th. Consider this Padres event on the 3rd to be the meat to your Final Four sandwich. This entry was posted in Baseball, Celebrities, Events, March Madness, MLB, News and tagged Adrian Gonzalez, Adrian Gonzalez Celebrity Bowling Event, Avenging Jack Murphy, Black Panthers, Bring Back The Brown, Chargers, Communist Russia, Cy Young, Ducksnorts, Final Four, Gaslamp Ball, I hate SF, Jane Mitchell, Kate Upton, Madres, Major League Baseball, Major League Baseball Opening Day, Mat Latos made San Francisco Cry, Opening Day, Padres blogs, Padres Blogs Unite!, Randy Jones, Randy Jones All American Sports Grill, RJs Fro, Ron Burgandy, San Diego, San Diego Hall of Champions, Storm baseball, The Sacrifice Bunt, Tommy Boy, VCU, Vincent Jackson, Woe Doctor. Bookmark the permalink. 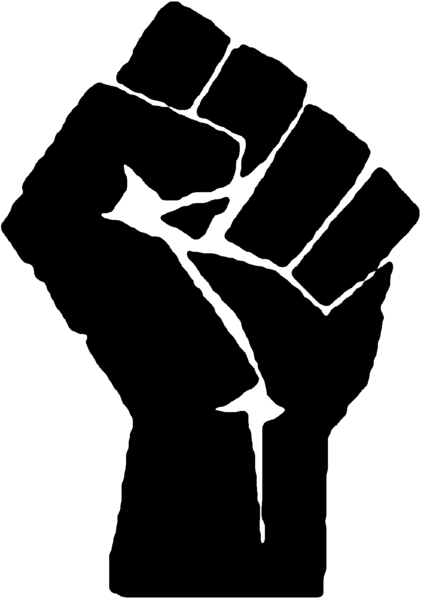 If you notice the fist is left handed….just like RJ. Coincidence? Yes…yes it was. 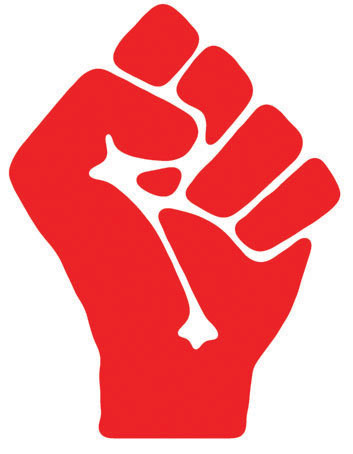 I wonder if Vladimir Lenin and Huey Newton were left handed too?